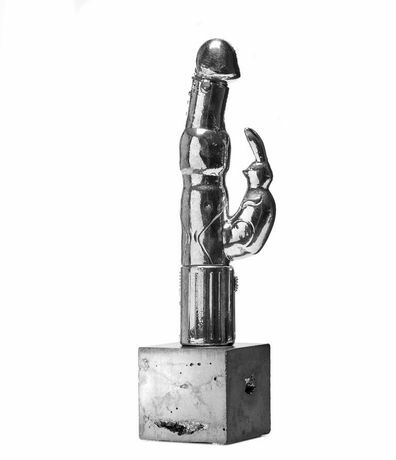 CJ Hendry, known for her hyperrealistic pen on paper drawings and cult social media following, will present he​r latest exhibition, ​The Trophy Room on November 3, 2016 at 79 Greene Street, New York. CJ Hendry, known for her hyperrealistic pen on paper drawings and cult social media following, will present he​r latest exhibition, ​The Trophy Room on November 3, 2016 at 79 Greene Street, New York. This exhibition will be her first in New York City. The Trophy Room is a lesson in icon worship, elevating the easily­ recognizable and highly­ coveted consumerist goods that bring us joy. A self confessed brand coveteur, CJ Hendry places her meticulously­ drawn renderings of brand­ name objects on literal pedestals, where they are represented as trophies and presented to viewers as items of wors​hip – a sign of the increasing prominence of today’s cult of consumerism.​ Continuing the tradition of pure Pop Art style, these icons are bestowed the charm and prestige of Fine Art. Hendry’s process touches upon our deep, often emotional connections to consumer items in a whimsical way ­ artifacts from our past, objects we exhibit great attachment to, possessions we covet for social status, among others. This consumer cult mentality is personal to Hendry, and drawing these objects is a way for her to process and mask her own vices. 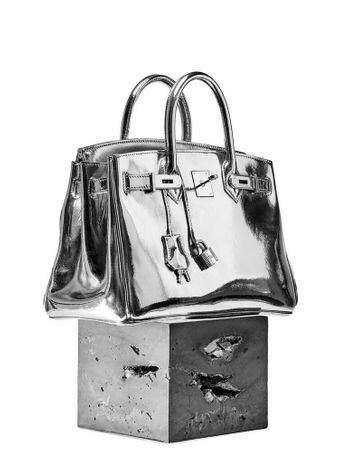 This inspection of icons in relation to Hendry represents her lifelong obsession with luxury and otherwise highly­ covetable items. In ​The Trophy Room, Hendry takes her infatuation with consumer idolatry to the next level by also creating literal trophies out of easily recognizable, iconic items and dipping them in liquid bronze. A headless Barbie, Beats headphones, an Hérmes Birkin bag – these objects have been coated in bronze and placed on concrete pedestals, then photographed and drawn meticulously in black ink. Through this process Hendry simultaneously destroys the original object with precious materials while immortalizing the trophy in ink. Inspired by architecture and advertising, Hendry’s fascination oscillates around marketing strategies and brand recognition. In a world where the constant barrage of social media influences informs our every purchase and lifestyle choice, Hendry chooses to both scrutinize and idolize these status symbols. These iconographic objects dictate a fetishism that draws on the accoutrements of naivety and youth under the guise of fashion, the unattainable masquerade of social media perfectionism, and brand marketing and product placement. Hendry first exploded into the international art scene after presenting Kanye West with a work entitled “Kash Kurrency,” a drawing of West’s face on a crumpled $100­ dollar bill. Since then, Hendry has continued to create works centered around luxury goods including crumpled Gucci and Louis Vuitton bag and the notable “50 Foods in 50 Days” series where she portrays singular foods on Hérmes plates. In addition to depicting luxury brand imagery and creating custom works for celebrities including Floyd Mayweather, Hendry involves aspects of social justice with her brand. After the shootings in Orlando, ​the artist created an image of a T­-shirt in the shape of a pistol, dripping with blood. The work was flown over several major cities in the US with the slogan #ENDGUNVIOLENCE trailing behind. Perhaps her most infamous social justice work to date, #SneakerDead, Hendry destroyed a pair of Air Nike Mags by dipping the sneakers in black paint. She created an ink drawing of the result, which was in turn auctioned to charity to purchase shoes for Sheltering Arms, which serves youth in the Bronx, Harlem, Brooklyn and Queens. About the Artist:​ CJ Hendry (b. 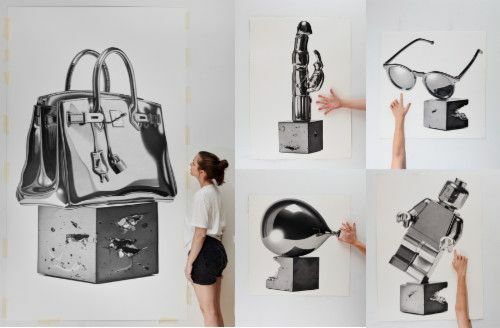 1988) is a New York­ based artist originally from Brisbane, Australia who transforms her fascination with contemporary material culture into large scale, photorealistic black­ and­ white drawings of consumer goods ranging from the ordinary to the aspirational. 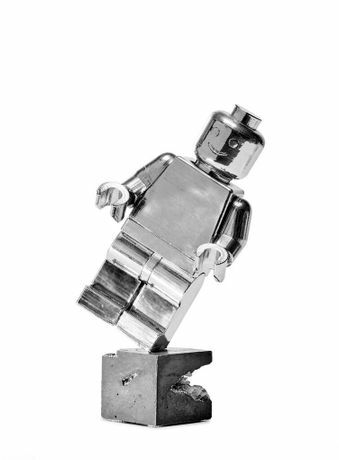 A self­ professed “lover of products,” Hendry is heir to the Pop Art tradition that brought depictions of everyday objects into the gallery and the museum. 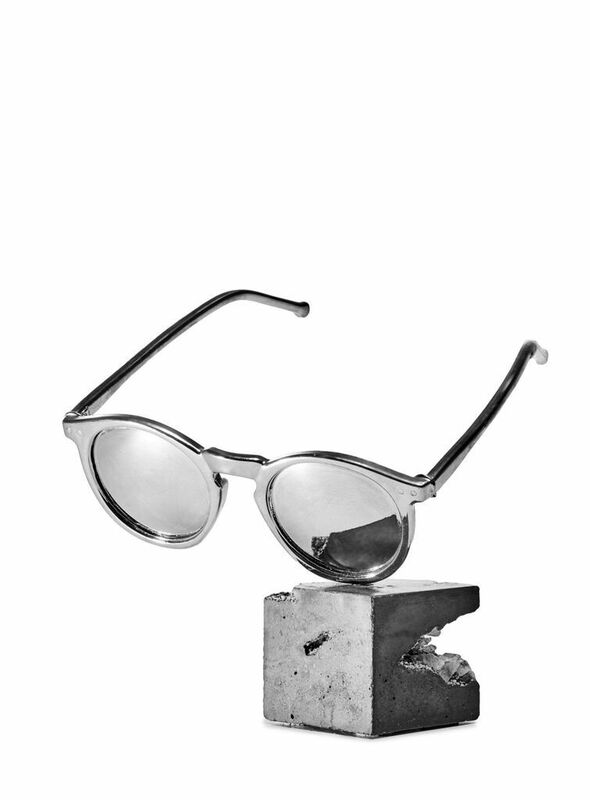 But whereas Pop artists were often known for sly, sarcastic critiques of mid­century consumerist culture, Hendry gleefully embraces the capitalist ethos of our time—in particular, the valorization of the entrepreneur; the ascription of personalities and values to brands; and the new authority of “views” and “impressions” as measures of influence. After spending seven years unenthusiastically studying architecture and finance in the belief that a degree was prerequisite for success, Hendry finally abandoned the endeavor to pursue art full­ time in 2014. Within months, she sold her first work. After a group exhibition and two solo shows in Sydney and Melbourne, in 2015 she moved from Australia to establish her New York studio. In 2016, Her debut New York solo show, the forthcoming “Trophy Room,” will be exhibited in the fall of 2016.